Black cat Hamlet joins the ranks of my favorite cozy cats; I love his attitude!!! 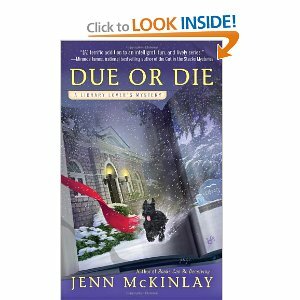 This is the first book in the series, set in a bookstore, one of my favorite locales for a cozy series. It's pretty cool how even though the book is set in Brooklyn, it still has that small town atmosphere as the tenants of the brownstone have developed deep friendships, especially Darla and Jake. I also really enjoyed little girl Callie, so spunky and such a cute young book lover. Can't wait for book #2! Love, love, love this series. No cozier setting for a mystery series than a New England library - especially in the midst of a Nor'easter! This one revolves around the murder of the new Friends of the Library president's husband. Loved spending time with the ladies of Briar Creek during their crafternoons, and I'm delighted with the addition of puppy Heathcliff. Can't wait to see Lindsey and Sully's relationship progress as well. 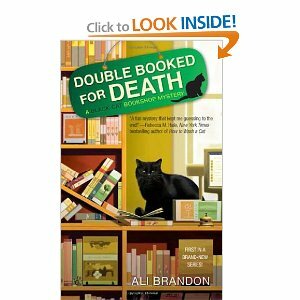 Book #2 in the Library Lover's Mystery series is a winner! Glory always dismisses ghost stories–until she inherits her great-uncle Louis's souvenir shop, where items seem to rearrange themselves and her pet parrot, Bluebeard, is suddenly uttering phrases he couldn't have picked up from customers. If Glory told anyone the shop was haunted, they'd think the fresh sea air has gone to her head. Then, at an end-of-summer party, local football hero Kevin Stanley dies, and the store starts to go haywire. Glory finally shares her secret with her best friend, who takes it seriously–and is convinced the ghost is trying to send a message. Kevin's death was no accident, and it's linked to Glory's very own great-uncle Louis. Now Glory must dig through the junk to find the truth, before someone leaves her with a deadly souvenir of her own. 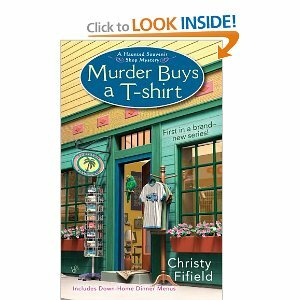 This mystery, the first in Christy Fifield's Haunted Souvenir Shop mysteries, is as light and breezy as a day spent in the Florida sunshine. Parrot Bluebeard absolutely steals the show...can't wait to find out why Uncle Louis has chosen to communicate with Glory through his pet. I predict there is much to be learned about his life and how he died. I enjoyed spending time with Glory and her friends during their Thursday night dinners, especially the mouth watering traditional Southern dishes they cooked up! Can't wait for the next book in this fun series. Hello all! I’m Lily Graison and I’ve spent the last nine years writing paranormal and contemporary romance but last year, I tried my hand at historical westerns. A genre I adore! My husband and I joined a local historical group in our area a few years ago and I spent enormous amounts of time researching, talking with other members, and I eventually dusted off my mother’s old sewing machine to try my hand at making a few dresses from the era. The 1860’s to be precise. Immersing myself into a bygone era led my adventurous muse to start wandering. It’s no secret I’ve always had a thing for cowboys and sitting around a campfire and cooking over an open flame, it was only natural my new Historical Series would be born from my instant fascination. The Outlaw is book 2 in my Willow Creek series, a fictional‘old west’ town in the Montana Territory. The series starts with the Avery brothers, four men who are as different from each other as you can get. The Lawman, Morgan Avery, introduced us to the small town of Willow Creek and his brother, Colton, The Outlaw, came riding in with his kidnapped heroine. Tristan—The Gambler, and Holden—The Rancher, will be featured in books 3 and 4 and will release in the coming months but for now, I want to introduce you to my Outlaw, Colton Avery, with a tasty excerpt that’s sure to please all you cowboy loving readers. Stepping out on the newly laid wooden sidewalk she set her sights on the outlaws, all sitting on their horses now, looking for one in particular. She found him moments later. He was shouting orders for the others to go. Lifting the heavy gun, she sighted on him and pulled the trigger. The outlaw’s hat flew over the top of his horse’s head. The animal reared up on its hind legs before the rider was able to get control of him. He turned the beast back to the bank and Sarah lifted the gun again. It wasn’t loaded but she hoped he would think otherwise. His black hair shined in the noonday sun. 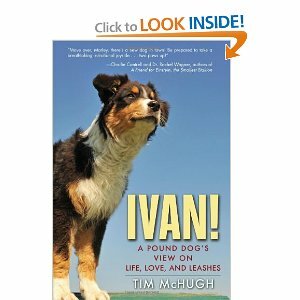 It was long, curling over the collar of his coat and fell over is forehead to lie across his eyebrows. Her breath was cut short when he locked eyes with her, lifting his hand to swipe those fallen locks out of his eyes. She was finally able to see them. They were the palest blue she’d ever seen. They held her in place, taunting her inability to handle the gun. The skin around his eyes wrinkled again and she knew he was smiling. She’d nearly shot his head off and the arrogant man was smiling. His laughter followed her curt demand. He sat up suddenly, swung his leg over the horses back, and jumped to the ground. Sarah tensed and took two steps back. Picking up his hat, he dusted it off and placed it on his head, lowering the front as he turned back to her. “It’s been a real pleasure, Ma’am, but I’m afraid I’m out of time.” In an act that spoke of his arrogance, or complete stupidity, he raised his hand and lowered the bandanna that covered his face. Sarah stared at him and knew she’d never see another man who looked as he did. Hard, cold and completely heart stopping. Sarah Hartford always dreamed of a grand adventure. She just never expected to find it in the arms of an outlaw. When her father’s bank is robbed, Sarah doesn’t make the gunslingers’ escape easy. Putting her own safety behind those she hopes to protect backfires when she’s kidnapped by one of the escaping men. Now her only hope for survival lies with the same arrogant man who laughed at her while staring down the barrel of her gun. Lily is offering up one copy of The Outlaw to one commenter. To enter, just comment and leave your name and email address. One winner will be chosen on Saturday, March 17. LILY GRAISON resides in North Carolina, a stones throw away from the Blue Ridge Mountains and a few hours from the Outer Banks. First published in 2005, her debut novel won a Reviewers Choice Award. The author of 12 books, Lily writes in the Contemporary Romance genre, as well as Paranormal Romance and Historical Western Romance. To find out more about Lily and her other books, visit her at the following locations. All I can say is Colt can kidnap me anytime. I love a western where a man and woman are alone on the trail together, and although this book isn't super steamy, the sexual tension between Colt and Sarah made my Kindle sizzle. I so enjoyed returning to the town of Willow Creek and it's residents--I was touched by Colt's father's reaction to Sarah, and appreciated the update on what's going on in Morgan and Abigail's lives (from The Lawman). Can't wait for book #3, The Gambler. And I'm so excited to announce that the wonderful Lily Graison will be a guest on my blog this coming Monday, March 12. She has some wonderful book swag to give away to one lucky commenter!!! Welcome to Bar Harbor, Maine, one of New England's most idyllic coastal towns. But as new food writer Hayley Powell is about to find out, the occasional murder can take a bite out of seaside bliss. . I love cozies set in Maine-for me it's the quintessential New England setting. Protagonist Hayley becomes a food columnist, which leads to death by clam chowder...isn't the cover perfect??? I enjoyed Hayley/s interactions with her BFF's Liddy and Mona, and her 2 teenagers. There is much humor as well, from the English-impaired police chief Sergio, to Hayley's attempt to retrieve a brooch from the murder victim at her funeral, to Hayley's wearing a potential beau as a hood ornament. The mystery flows along perfectly, with a wealth of suspects for Hayley to sort through. Fun, fun, fun read. Can't wait for book #2, Death of a Country Fried Redneck, in November. Get to know the Divorced Divas in this mini-mystery prequel to the Divas upcoming novel, Strung Out To Die. Holly Harper's life is finally getting back on the right track after her divorce from "what's his name." 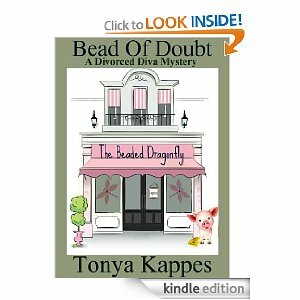 She and a group of divorcees have formed a strong bond plotting creative ways to get back at their exes by creating a self-help group known as The Divorced Divas where the meeting are held in Holly's bead store, The Beaded Dragonfly. 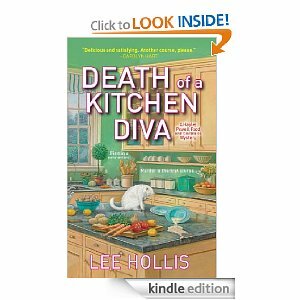 There's more than just beading going on when Diva Marlene's rare Spinet Yellow Diamond goes missing and Holly was the last one to see it, or so they thought. Olivia Davis is back, still breaking hearts with her breakup service SPLITSVILLE.COM. Olivia's best friend, Erin, has opened a matchmaking business, Color Me Love, where Olivia sits behind a two-way mirror making love connections by matching up their auras. 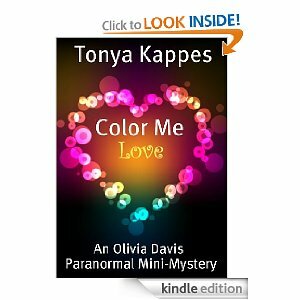 With love in the air, and Valentine's Day fast approaching, Olivia is determined to figure out why everyone in Park City has lost their marbles, while figuring out how to get a date with one of the potential clients for Color Me Love.